This is the nature of institutions: they operate no higher than the root mean square of the moral, ethical, and legal development of their operators. I have a couple of comments, apparently stuck in moderation limbo, up at the Augean Stables concerning Prof. Richard Landes’ article My Talk at Connecticut College About the Pessin Affair, and which I have aggregated below. This article was a continuation of the discussion of the Pessin Affair which began at the Augean Stables back on July 29, 2015: Salem on Thames, what Connecticut College’s Andrew Pessin teaches us. A briefer version of the article was published at American Interest on July 30, 2015. In brief, the Pessin Affair involved the fallout from events at Connecticut College during the Spring of 2015 concerning Philosophy Professor Andrew Pessin. I give a brief expert of Prof. Landes’ article below for the context. 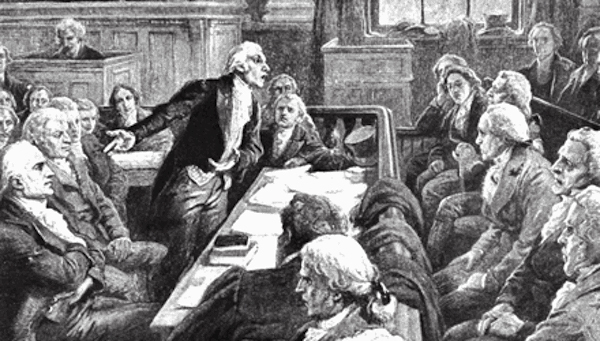 The treason trial of Aaron Burr, legal pleadings or legal fictions? Steve McIntyre. announced a change in moderation policy a few days ago at his blog Climate Audit in response to the recent Fokker Scourge of blog spam that has been sweeping the blogosphere. Somehow I seem to have fallen afoul of the new anti-spam procedures, which is ok, but my most recent comment, presently in moderation limbo, awaits the Descensus Christi ad Inferos promised to posts that despite their possible sins, died in friendship with the moderator and await their present resurrection. Hopefully Steve M. or some kind moderator will notice before the comment becomes completely irreverent – things move quickly in the blogosphere. This came across the electronic desktop this morning, sent to me by a friend. Here’s a quick syllogism on the subject. Rothschild is a bank, banks enable modernity and development therefore banks are found where ever you find development and or modernity. To a certain extent Rothschild in particular may also be self-serving to the point of being evil – much like any trans-national corporation whose corporate controllers no longer have any ties of either: friendship, kinship, nationality, culture, or interests with the vast majority of the people they serve and the only people they have any genuine ties with are their fellow controllers of trans-national institutions in government, business, and academia. The real problem seems to be much more that “the global village” is still very much a zero-sum tribal affair where trans-national quasi-individuals are either in naked collusion with one another or are involved in the kind of cattle rustling operations favored by the archaic warrior prince. The only real antidote to the problem is societal evolution. We need better people, fortunately evolution is hard at work on the problem. A Resignation at EPFL – A rejection of mediocrity in academia or academic suicide? Cassandra or a wake up call? In the last few days an interesting missive has been circulating in the blogosphere, a letter of resignation from an anonymous PhD candidate at the École Polytechnique Fédérale de Lausanne, one of Europe’s top research institutes, outlining his frustration, and disappointment with the system of academic science and ultimately his rejection of continuing to participate in the system. I don’t think that the exposed facts are a problematic unique to EPFL, nor to any other Swiss university: to the contrary, this is probably a worldwide phenomenon. Finally, I would like to make very clear that I did not experience the same feelings at all during my (very happy) PhD times at EPFL. So, don’t try to make any parallel with my own experience. Like the author, I don’t have any good idea how to change the system towards a better one. Sean Summers an achievement oriented post-doc at ETH Zurich had a rather scathing response The Value of a Degree at his personal website. He seem to have been grossly offended by the letter and didn’t seem to want to admit to any of the problems it outlined – and conducted a point by point rebuttal of the letter. He also doesn’t seem to allow comments on his articles either. …Here’s the thing. In the process though, you threw everyone (myself very recently included) with a PhD under a bus…. Mostly, I don’t like the way that you have devalued individual achievement. I’m here to say that a PhD is remarkable; it is an amazing personal achievement worthy of pride. Personal achievement in all shapes and form should be celebrated, with head held high. Anthony Watts and crew over at WUWT have their own conversation rolling on the subject, A window into academia – via a resignation letter, which, predictably, runs the gamut. Most interestingly of all, this is what the author of that note had to say in comments on Junod’s blog [emphasis added]. I’ve been on an extended holiday from blogging, but since I still seem to have something to say I’ll say just say it now. E.M. Smith aka Chiefio, – I have to get used to this, E.M seems to have ditched his pseudonym and is now going by his initials in public – has a new post up Same Solution, Same Problem, no fix which is a musing on the classic Audrey Hepburn movie Roman Holiday, the light hearted fairtale of a truant princess who skips out on her royal responsibilities for a day for before returning to the more serious duties as a figurehead of state. Solutions proposed by fictitious princesses in 1953 don’t seem to be much different than what is proposed by fairy tale politicians today according to E.M.
AMERICAN CORRESPONDENT [speaking from the crowd] Does Your Highness believe that Federation would be a possible solution to Europe’s economic problems? ANN. I am in favour of any measure which would lead to closer cooperation in Europe. So is it time we started talking about Angela Merkel being on a Roman Holiday? The tendency towards, “… any measure which would lead to closer cooperation in Europe,” is a faulty response to the general evolutionary pressure towards the globalization and unification of human culture and civilization.